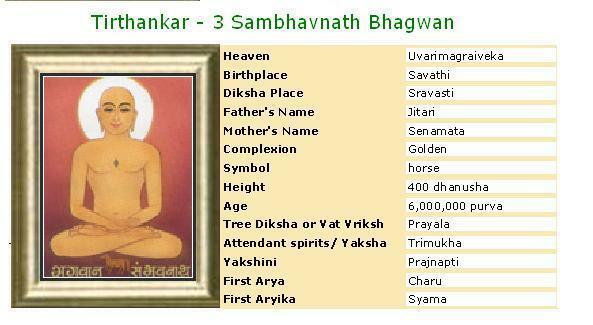 Sambhavanath was the third Jain Tirthankar of the present age (Avasarpini). According to Jain beliefs, he became a siddha, a liberated soul which has destroyed all of its karma. Sambhavnath was born to King Jitari Raja and Queen Saina Rani at Sravasthi in the Ikshvaku clan. His birth date was the fourteenth day of the Margshrsha shukla month of the Indian calendar. A long time after the Nirvana of Bhagavan Ajitnath, the city of Kshempuri in the Airavat area of Mahavideh was ruled by king Vipulvahan. He was a soft hearted and compassionate ruler who loved and cared for his subjects. Once when there was a devastating drought and the population was deprived even of a few drops of water, the king opened his grain yards for the public, his kitchen for the monks and ascetics and his treasury for the import of food grains. He instructed the caretaker of his personal kitchen that the doors of his kitchen should be open to all and sundry. All guests should be given priority over himself. Whatever little is left should be served to him. If nothing is left he would be contented with the pleasure of serving his guests. During the drought there were many occasions when the king remained unfed and thirsty. As a result of this sublime feeling of compassion, Vipulvahan acquired unique purity of soul and earned the Trithankr-nam-and-gotra-karma. Although, after the drought normalcy returned, the torture of the living world by the nature left a mark on Vipulvahan's psyche. One day while he was standing on the roof top he witnessed dense rain clouds being scattered by wind. A feeling of intense detachment grew in him. He handed over his kingdom to his son and took Diksha from Svayamprabh Suri. After completing his age he reincarnated in the Anat dimension of gods. From the Anat dimension, the being that was Vipulvahan descended into the womb of queen Sena Devi, wife of king Jitari of Shravasti. While this being was still in the mother's womb there were sufficient rains and abundant crop. One day when the king and queen were happily watching the lush green vegetation all around, from their roof top, the king said, "My dear! This time even the waste-land is filled with grain crop. It seems that all this that is impossible, has been made possible (Sambhav) due to the auspicious influence of the pious soul you carry in your womb. We shall call our son- Sambhav." On the fourteenth day of the bright half of the month of Margshrish, the queen gave birth to a healthy son and he was ceremoniously named Sambhav Kumar. The little prince grew up in royal comfort but he hardly ever took more than cursory interest in the luxurious life style. At the appropriate age Sambhav Kumar was married and crowned. After a long and peaceful reign he became an ascetic on the fifteenth day of the bright half of the month of Margshrish. After a fourteen year period of spiritual practices, he attained omniscience. Arhat Sambhavnath gave his first discourse on the ephemeral nature of the mundane existence. For a long period he worked for the spread of religion. He attained Nirvana on the fifth day of the bright half of the month of Chaitra.